It’s time to arm yourself with knowledge against the well-meaning astronomical onslaught. The month of June sees the celestial action heat up come sundown, as the planet Jupiter closes in on Venus in the dusk sky. Both are already brilliant beacons at magnitudes -1.5 and -4 respectively, and it’s always great to catch a meeting of the two brightest planets in the sky. Be sure to follow Venus and Jupiter through June, as they close in on each other at a rate of over ½ a degree—that’s more than the diameter of a Full Moon—per day. Venus starts June at 20 degrees from Jupiter on the first week of the month, and closes to less than 10 degrees separation by mid-month before going on to a final closing of less than one degree on the last day of the June. Th climax comes on July 1st, when Venus and Jupiter sit just over 20’ apart—2/3rds the diameter of a Full Moon—on July 1st at 3:00 UT or 11:00 PM EDT (on June 30th). This translates to a closest approach on the evening of June 30th for North America. … and finally, looking westward on the evening of July 1st. Venus starts the first week of June forming a straight line equally spaced with the bright stars Castor and Pollux in the astronomical constellation Gemini. On June 12-13, Venus actually nicks the Beehive cluster M44 in the constellation Cancer, a fine sight through binoculars. Jupiter and Venus will then be joined by the Moon on the evening of June 20th to form a skewed ‘smiley face’ emoticon pairing. Not only is the pairing of Venus and the crescent Moon represented on many national flags, But the evening of June 20th will also be a great time to try your hand at daytime planet spotting before sunset, using the nearby crescent Moon as a guide. The Moon will actually occult Venus three times in 2015: On July 19th as seen from the South Pacific, on October 8th as seen from Australia and New Zealand, and finally, on December 7th as seen from North America in the daytime. This conjunction of Venus and Jupiter occurs just across the border in the astronomical constellation of Leo. As Venus can always be found in the dawn or dusk sky, Jupiter must come to it, and conjunctions of the two planets occur roughly once every calendar year. A wider dawn pass of the two planets occurs this year on October 25th, and in 2019 Jupiter again meets up with Venus twice, once in January and once in November. The last close conjunction of Venus and Jupiter occurred on August 18th, 2014, and an extremely close (4’) conjunction of Venus and Jupiter is on tap for next year on August 27th. Check out our nifty list of conjunctions of Venus and Jupiter for the remainder of the decade from last year’s post. The view through the telescope on the evenings June 30th and July 1st will be stunning, as it’ll be possible to fit a 34% illuminated 32” crescent Venus and a 32” Jupiter plus its four major moons all in the same low power field of view. Jupiter sits 6 astronomical units (AU) from Earth, and Venus is 0.5 AU away on July 1st. Venus reaches solar conjunction this summer on August 15th, and Jupiter follows suit on August 26th. Both enter the field of view of the European Space Agency’s Solar Heliospheric Observatory (SOHO) LASCO C3 camera in mid-August, and are visible in the same for the remainder of the month before they pass into the dawn sky. Remember: Scientific ignorance can be harmful, and astronomical knowledge of things in the sky can save lives! Missing the planets this month? With Mars receding slowly to the west behind the Sun at dusk, the early evening sky is nearly devoid of planetary action in the month of November 2014. Stay up until about midnight local, however, and brilliant Jupiter can be seen rising to the east. Well placed for northern hemisphere viewers in the constellation Leo, Jupiter is about to become a common fixture in the late evening sky as it heads towards opposition next year in early February. The line-up during the November 25th eclipse event (see chart below). Note that Jupiter’s moons are in 1-2-3-4 order! Credit: Stellarium. An interesting phenomenon also reaches its climax, as we make the first of a series of passes through the ring plane of Jupiter’s moons this week on November 8th, 2014. This means that we’re currently in a season where Jupiter’s major moons not only pass in front of each other, but actually eclipse and occult one another on occasion as they cast their shadows out across space. These types of events are challenging but tough to see, owing to the relatively tiny size of Jupiter’s moons. Followers of the giant planet are familiar with the ballet performed by the four large Jovian moons of Io, Europa, Ganymede, and Callisto. This was one of the first things that Galileo documented when he turned his crude telescope towards Jupiter in late 1609. The shadows the moons cast back on the Jovian cloud tops are a familiar sight, easily visible in a small telescope. Errors in the predictions for such passages provided 17th century Danish astronomer Ole Rømer with a way to measure the speed of light, and handy predictions of the phenomena for Jupiter’s moons can be found here. A look at selected upcoming occultation events. Credit: Starry Night. Credit and copyright Christoper Go, used with permission. Mutual occultations and eclipses of the Jovian moons are much tougher to see. The moons range in size from 3,121 km (Europa) to 5,262 km (Ganymede), which translates to 0.8”-1.7” in apparent diameter as seen from the Earth. This means that the moons only look like tiny +6th magnitude stars even at high magnification, though sophisticated webcam imagers such as Michael Phillips and Christopher Go have managed to actually capture disks and tease out detail on the tiny moons. A double shadow transit from 2013. Photo by author. What is most apparent during these mutual events is a slow but steady drop in combined magnitude, akin to that of an eclipsing variable star such as Algol. Running video, Australian astronomer David Herald has managed to document this drop during the 2009 season (see the video above) and produce an effective light curve using LiMovie. Such events occur as we cross through the orbital planes of Jupiter’s moons. The paths of the moons do not stray more than one-half of a degree in inclination from Jupiter’s equatorial plane, which itself is tilted 3.1 degrees relative to the giant planet’s orbit. Finally, Jupiter’s orbit is tilted 1.3 degrees relative to the ecliptic. Plane crossings as seen from the Earth occur once every 5-6 years, with the last series transpiring in 2009, and the next set due to begin around 2020. Incidentally, the slight tilt described above also means that the outermost moon Callisto is the only moon that can ‘miss’ Jupiter’s shadow on in-between years. Callisto begins to so once again in July 2016. A look at the six types of phenomena possible with Jupiter’s four large moons. Created by the author. This month, Jupiter reaches western quadrature on November 14th, meaning that Jupiter and its moons sit 90 degrees from the Sun and cast their shadows far off to the side as seen from the Earth. This margin slims as the world heads towards opposition on February 6th, 2015, and Jupiter once again joins the evening lineup of planets. Early November sees Jupiter rising around 1:00 AM local, about six hours prior to sunrise. Jupiter is also currently well placed for northern hemisphere viewers crossing the constellation Leo. The Institut de Mécanique Céleste et de Calcul des Éphémérides (IMCCEE) based in France maintains an extensive page following the science and the circumstances for the previous 2009 campaign and the ongoing 2015 season. A look at selected events through the end of 2014. 1=Io, 2=Europa, 3=Ganymede, 4=Callisto. O=Occultation, E=Eclipse. Created by the author, adapted from the IMCCEE chart for the 2014-15 season. Note that this season also produces another triple shadow transit on January 24th, 2015. Observing and recording these fascinating events is as simple as running video at key times. If you’ve imaged Jupiter and its moons via our handy homemade webcam method, you also possess the means to capture and analyze the eclipses and occultations of Jupiter’s moons. A view never seen from the Earth… Io (upper left) paired with a crescent Europa during New Horizons’ 2007 flyby. Credit: NASA/JPL. Good luck, and let us know of your tales of astronomical tribulation and triumph! Lovers of planetary action rejoice; the king of the planets is returning to the evening skies. One of the very first notable astronomical events for 2014 occurs on January 5th, when the planet Jupiter reaches opposition. You can already catch site of Jove in late December, rising in the east about an hour after local sunset. And while Venus will be dropping faster than the ball in Times Square on New Year’s Eve to the west in early 2014, Jupiter will begin to dominate the evening planetary action. Orbiting the Sun once every 11.9 years, oppositions of Jupiter occur about once every 13 months or about 400 days, as the speedy Earth overtakes the gas giant on the inside track. This means that successive oppositions of the planet move roughly one astronomical constellation eastward. In fact, this year’s opposition is it’s northernmost in 12 years, occurring in the constellation Gemini. “Opposition” means that an outer planet is rising “opposite” to the setting Sun. As this opposition of Jupiter occurs just weeks after the southward solstice, Jupiter now lies in the direction that the Sun will occupy six months from now during the June Solstice. This all means that Jupiter will ride high in the sky for northern hemisphere observers towards local midnight, a boon for astrophotographers looking to catch the planet high in the sky and out of the low horizon murk. Jupiter will reach its most northern point for 2014 at a declination of +23.3 degrees on March 11th. Jupiter also “skipped” 2013, in the sense that it was an “oppositionless year” for the giant world, as said 13 month span fell juuusst right, first on December 2nd, 2012 and then on January 5th, 2014. The next opposition of Jupiter will occur on… you guessed it… February 6th, 2015. The last year missing an opposition of Jupiter was 2001. 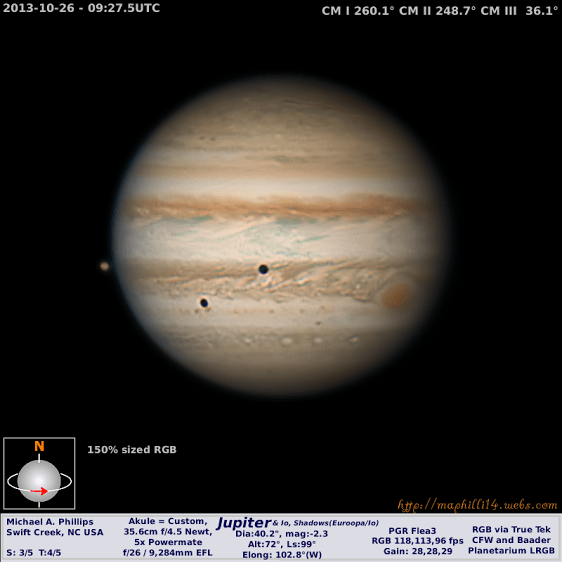 Jupiter and Io (arrowed) as imaged on the evening of December 22nd, 2013 by the author. The exact timing of Jupiter’s opposition to the Sun in right ascension occurs at 21:00 UT/4:00 PM EST on January 5th. Its closest approach to Earth, however, arrives 27 hours prior, owing to a slight outward curvature of the approach of the two worlds. Jupiter will then lie about 4.21 astronomical units (AUs) or 629 million kilometres distant. This is just about down the middle of how close it can pass; Jupiter was just under 4 AUs distant in September 2010, and can pass almost 4.5 AUs from Earth, as happened in April 2005. Jupiter also reaches a maximum brightness of magnitude -2.7 at opposition in 2014 and presents a disk 46.8” arc seconds wide. The coming month also provides a great chance to catch Jupiter in the daytime sky just before sunset, when the waxing gibbous Moon passes 4.9 degrees south of the planet on the evening of January 14th. The Moon and Jupiter on the evening of January 14th shortly before sunset. (Created by the Author using Stellarium). The very first thing you’ll notice looking at Jupiter, even at low power with binoculars or a telescope, is it retinue of moons. Though the planet has 67 discovered moons and counting, only the four large Galilean moons of Io, Europa, Ganymede and Callisto are readily apparent in a telescope. It’s fun to see orbital mechanics in action and watch them from night to night as they change position, just as Galileo first did over four centuries ago. This provided him with evidence that there is much more to universe than meets the eye, though we can consider ourselves fortunate that his proposal to name them the “Medician Moons” after his Medici benefactors was never widely adopted. Crank up the magnification, and you’ll notice the large twin stripes of the northern and southern equatorial cloud belts crossing the disk of Jupiter. While the northern belt is stable, the southern belt has been known to submerge and disappear from view about every decade or so, as last happened in 2009-2010. You’ll also notice the Great Red Spot, a massive storm system over three times larger than the Earth that has been tracked by astronomers since it was recorded by Samuel Schwabe in 1831. The planet has the fastest rotation of any world in our solar system at 9.9 hours, and you’ll notice this swift rotation tracking Jupiter over the course of a single evening. Transits and occultations of Jupiter’s moons are also always interesting to watch. The variation in the timing of these events at differing distances led Danish astronomer Ole Rømer to make the first attempts at measuring the speed of light in 1676. Europa just beginning to cast a shadow off to one side shortly after opposition on January 8th at 7:30 PM EST. (Created by the author using Starry Night). It’s interesting to note that Jupiter and its moons cast a shadow nearly straight back from our line of sight around opposition. You can see this change as the planet heads towards quadrature on April 1st, 2014 and Jupiter and its moons cast shadows off to one side. We’re also in the midst of a plane crossing, as the orbits of the Jovian moons appear edge-on to our line of sight in 2014 headed into early 2015. The outermost Jovian moon Callisto began a series of transits in 2013 and will continue to do so through 2014. This is a great time to begin following all of the Jovian action, as we head into another exciting year of astronomy!